It’s hard to believe the scale or imagine the energy that is Dreamforce. As part of the Salesforce Platform, a platform with a growing developer community and an amazing range of technologies, Heroku will join the party November 18-21 in San Francisco. This is a big deal for us. A few weeks ago we announced the Salesforce $1 Million Hackathon. By the way, that’s $1 million cash, the single largest hackathon prize in history. The response from our developer community has been fantastic – the winning app will be undoubtedly amazing. Heroku will also be a big part of developer workshops, the genius bar, several demo stations and a whole list of sessions. Extra bonus, the DevZone includes an area dedicated to the Internet of Things. 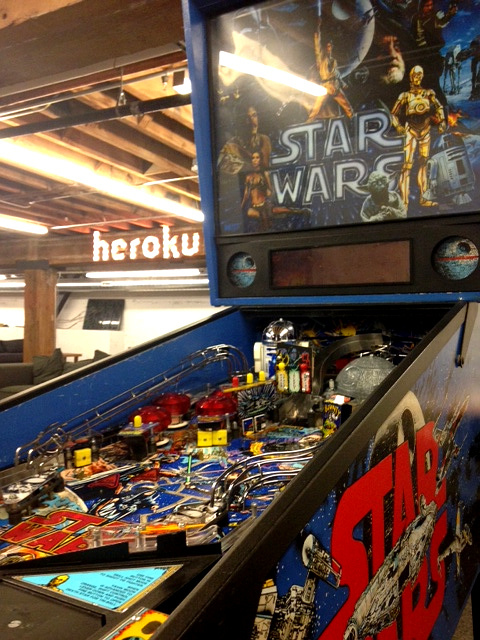 We won't give away all the details, but the Salesforce Platform is pretty excited to have joined forces with connected product gurus, Xively, and long-time Heroku partner Ionia, to create a connected vintage pinball arcade. Locks have been picked, sensors installed…Death Star ready for battle. - Application Security: Secure Heroku Apps with HP Fortify on Demand Along with the release of their Heroku add-on, the HP Fortify on Demand team will walk developers through their trusted security monitoring cloud service. - Using Heroku Postgres to Manage Your Salesforce Data On the heels of the Heroku Postgres 2.0 release, we'll show developers how to leverage Heroku Postgres to bring new data management capabilities to Salesforce Platform integrations. - 5 Ways Connected Products Will Transform Your Business We've engineered a very cool connected product to demonstrate just why companies need to become connected companies. Here’s a sneak peek of some of our handiwork. Dreamforce is going to be a great show, hope to see you there.